Rinns of Islay Lighthouse was established in 1825 and is situated on the small Island of Orsay off the south coast of Islay. 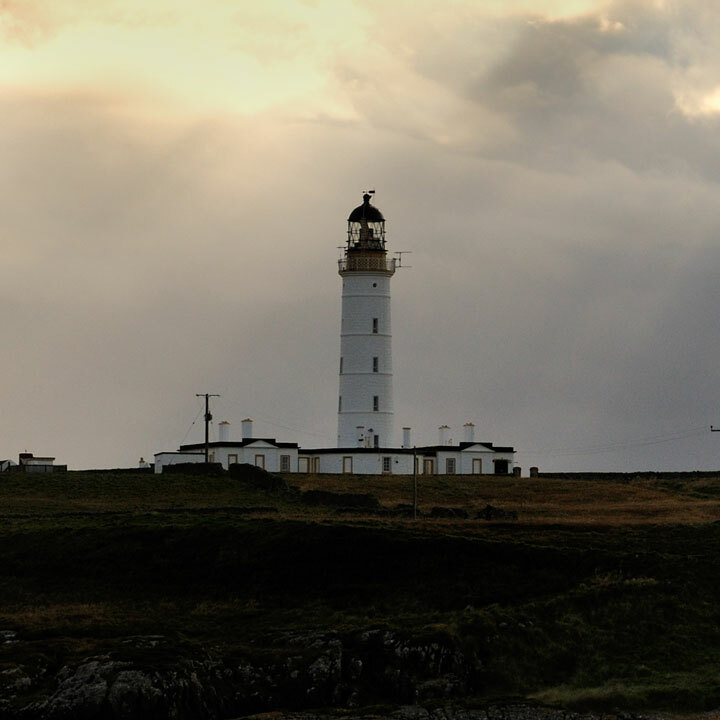 Rinns of Islay Lighthouse is situated on the small Island of Orsay off the south coast of Islay. Rinn is the Gaelic for point, but in this case the name came from Gaelic Rann, a division. The Rinns formed one of the three divisions of Islay. The Engineer used all his ingenuity in trying out new ways to distinguish one light from another. Rinns of Islay was alternately stationary and revolving, producing a bright ‘flash’ of light every 12 seconds, without those intervals of darkness which characterise other lights on the coast. The cost of this lighthouse was between £8,000 and £9,000 and John Gibb of Aberdeen was the contractor for the splendid tower. Provisions and other light stores were brought by boatmen permanently attached to the station and they also did the reliefs. Boats were normally located at the nearest point of land. Inevitably, these boats operated in stormy waters among strong tides, but accidents seldom occurred. In storms in 1877-78, however, attending boats were lost or seriously damaged by being swamped or driven ashore. In 1978 the light was changed to electric operation and this sealed beam light, mounted on a gearless revolving pedestal, has proved a real step forward in lighthouse illumination. The Rinns of Islay lighthouse was automated on 31 March 1998.